HomeSEO / SEMSearch Engine OptimizationFrom where to get new ideas for content? In the age of wire and network where content marketing is the only marketing left, a fresh persuasive and regular content holds ample importance. Readers now are really quick in reading or watching the content on their mobiles. Thereby, requiring the writers to be swift and smart enough to catch new ideas and develop them with their creativity. I know coming up with a new and good content idea every day is a challenging and time-consuming process. Therefore, here are 5 different ways in which finding a new and relevant content idea won’t be such a task. 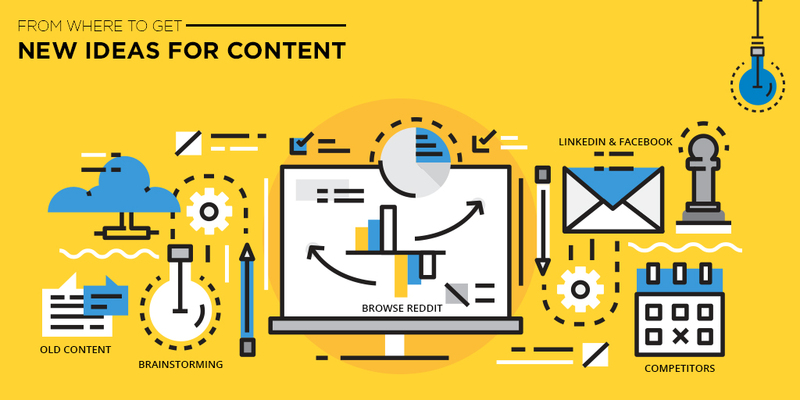 Browse Reddit: If you have never browsed Reddit before then do it once, It can be a powerful idea sourcing tool in your content marketing strategy. Browse the collection of topics in your field and see what has been upvoted all this while. Pull out the relevant content idea, read it subreddit and wiki pages if exists and add them to your notes. LinkedIn and Facebook: LinkedIn and Facebook have really grown popular over last few years where people open it first to look for any contact, idea or information. There are a number of groups exist on these platforms where people discuss a variety of topics. Depending on your industry, you can join these groups, contribute to the discussions, learn what is more talked about and develop your next idea from there. Brainstorming: The oldest of technique but still the best one. You just have to sit with a paper and pen and time yourself for a fixed 10 or 20 minutes. In this time whatever comes to your mind, write it down on paper. Write everything you can think of, doesn’t matter relevant or irrelevant then when the timer goes off, study and try to work if any idea can be developed from your scribblings on paper. Competitors: Keeping an eye on competitors is must irrespective of the industry you are writing for. They are another best source to get ideas from. I am not saying that you copy from them but you can find inspiration from there. For example, read their post, evaluate the comments written by readers there. Now see, if there is any discontent in the reader’s comment or anything which you feel is important and not touched upon, can be developed into your new content idea. Old content: Getting a new content idea from old posts should also be tried once.Go through your old write-ups and see how they can be used to write a new article. Maybe the old write up can be used to prepare a new comparison article or chances are there that you have learned a lot after publishing that old article, so, now you can update it, modify it and create a new topic. At times chances are there that without realizing you happen to answer the same question again and again in your blog comments section. So, scroll this section too as you never know if some new theme crops up. More, along with above points, BuzzSumo, UberSuggest, HubSpot’s Blog Topic Generator are few online tools which can also be used for free to find new and trending ideas for content. So, now enjoy writing.